The Other Kate told me to pack up these bad puppies and send them to her. So I did. They are gone. I feel much lighter and happier, at least in the knitting department, and I have been roaring along on these, which are making me happy. The yarn is a silk/merino single ply which is fabulously smooth but has no spring and is kind of splitty. The pattern is one I made up, and continue to make up as I go along. 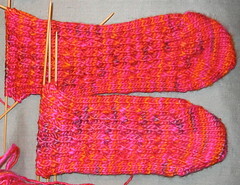 They are toe up even though I prefer top down because I have one more skein of yarn and I will need 1/2 for each sock, and I want to Use it All Up. Raising kids, you never know exactly what milestone is going to be big. Alice has been growing smarter and stronger pretty fast over the last couple months, and she has taken up knitting, teaching herself how to go back and forth, and learning how to use dpns to go around in circles, figuring out decreases... That was big, but she kind of snuck it past me. The one that flattened me today was soldering lessons. She and Al, sharing the same great thought, each bought a robot kit for the other for Christmas, to share. So there are two different purple robot kits ready to go. They started one yesterday and realized there was a fair amount of soldering involved, and we decided to call in Dr Bill. Because Al is the ugliest solderer ever. Ever, and still have the object work, and sometimes it doesn't, on account of bad soldering. So Bill came over this afternoon with family in tow, and he carefully showed Alice and Aerin how to do it properly, and they did nicely, and then floated off to play with their virtual cousin. Bill tried to help Al too, but it didn't take. So both girls can solder now, and put together robot kits. Alice still needs help and oversight, but Aerin can start working on the backlog we have lying around the house. After she finishes her T-Rex automaton.